Trans fats are unsaturated fatty acids formed when vegetable oils are partially hydrogenated. Hydrogenation makes the fats more solid or into a more stable liquid. Trans fats also occur naturally in low amounts in meat and dairy products. Trans fats account for 2% – 4% of the total calories in the American diet — compared with 12% saturated fat and 34% from total fat. Naturally occurring trans fats in animal products accounts for approximately one-fifth of the trans fats consumed. Are Trans Fats Listed on the Nutrition Facts Label? There is currently no provision for the listing of trans fats on the nutrition facts label. However, the Food and Drug Administration (FDA) is considering a proposed rule for including trans fat on the nutrition label. Why Are Trans Fats Used? Hydrogenated oils are used as a replacement for fats higher in saturated fat and/or to improve the freshness and texture of foods. Hydrogenated oils resist rancidity longer than un-hydrogenated oils which increases the shelf life of products that contain them. They also allow for taste and texture improvements such as flakier pie crusts, crisper crackers and spreadable margarine. Does Peanut Butter Have Partially Hydrogenated Oils? Regular peanut butter does contain a tiny, tiny amount (far less than 1%) of partially hydrogenated oil. It keeps the oil from separating out of the peanut butter and rising to the top of the jar, makes the peanut butter creamier, and dramatically increases the shelf life of the peanut butter. The resulting amount of trans fat in regular peanut butter is so small that, under the proposed FDA labeling guidelines for trans fats, the peanut butter labels will list 0 trans fats. The proposed FDA rule indicates that trans fat amounts of less than .5g cannot be accurately measured and will be listed on the label as 0. However, natural peanut butters do not contain partially hydrogenated oils. There are a number of natural peanut butters on the market, so consumers who wish to completely avoid partially hydrogenated oils can still enjoy peanut butter. The peanut oil will rise to the top. Simply stir it back in before using. Why the Concern Over Trans Fats? Recent research has suggested a link between increased LDL-cholesterol levels and trans fats. While there is still research to be done to prove a cause-effect relationship for trans fats, there is no question that saturated fats do raise LDL-cholesterol levels. Therefore, nutritionists generally do not recommend substituting foods higher in saturated fats for foods with trans fats. Increased LDL-cholesterol levels are one risk factor in heart disease. Remember, though, that there are many other factors involved such as maintaining a healthy weight, leading a physically-active life, diabetes, high blood pressure, gender, age and heredity. The best advice from nutritionists is still to lower the overall fat in your diet to no more than 30% of your daily calories and the saturated fat in your diet to no more than 10% of your daily calories. Reducing the overall fat in your diet will naturally lead to lower saturated and trans fat intake as well. Peanut butter is nutritious as well as delicious! 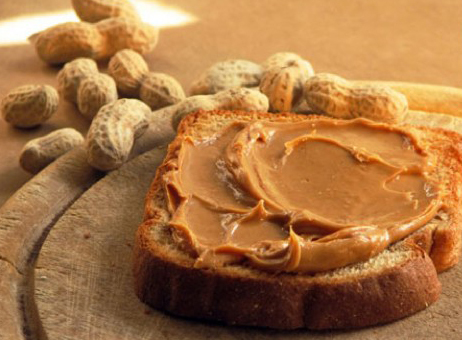 Peanut butter is a good source of protein, vitamin E, niacin, phosphorus and magnesium. A peanut butter and jelly sandwich provides 18% of the daily folic acid intake recommended to help reduce birth defects and heart disease. Peanut butter, like most foods, contains some fat. Fortunately, 80% of the fat in peanut butter is unsaturated fat — “the good fat” — which may actually help lower LDL-cholesterol levels in your blood. In fact, because peanut butter is so versatile, good tasting and nutritious, it is included in many medically endorsed weight loss and diabetic diets.